Relationship Counseling for Couples and Individuals in South Orange County designed to help couples communicate more effectively, rebuild trust and ultimately enjoy lasting and fulfilling relationships. Carly Ketchum, MA, MA, LMFT offers personalized guidance and caring support as she helps couples overcome significant relationship obstacles and reconstruct stronger, more satisfying marriages. Using counseling techniques based on the most cutting-edge relationship research, Carly will help you and your partner develop skills and learn to use the tools that have helped thousands of other couples who now enjoy happy, loving, long-lasting marriages. To get to know Carly better and learn more about her approach to marriage and couples counseling at Marriage Made Better™, click here. End destructive arguing. Reconnect in your marriage. Rebuild trust after an affair. Discover how counseling can help you and your partner repair your relationship and provide a road-map for having a closer and more satisfying marriage. Discover New Ways to Communicate. Criticism, nagging, blaming or just shutting down into silence are toxic to relationships. Relationship Counseling can help you and your partner learn how to effectively communicate about complaints and differences, so you can replace resentment and hostile arguing with understanding and creative problem-solving. Disagreements are a normal and unavoidable part of long-term relationships. It's how a couple navigates inevitable differences that ultimately determines the longevity and vitality of a relationship. Reconnect in Your Marriage & Be Great Parents. Marriage gets a lot more complicated after having kids. While navigating busy schedules and tackling endless to-do lists, couples can find themselves feeling disconnected, frustrated, and unappreciated. Relationship Counseling can help. You and your partner can learn how to prioritize your marriage while also being the kind of parents you want to be. Together you will discover your parenting philosophies, work through differences, and ultimately define the shared guiding values for your family. You will also learn specific strategies and tools for reconnecting and prioritizing your marriage. Rebuild Trust After an Affair. The discovery of an affair is devastating and often sends both partners into a state of chronic anxiety, panic, anger and resentment. The good news is that with the help of Relationship Counseling, many couples are able to successfully rebuild trust, restore feelings of love and respect, and reconstruct an even better, more fulfilling marriage after an affair. With practical guidance and personalized treatment, you and your partner can learn how to reconstruct a stronger marriage foundation after an affair and to protect your marriage from future betrayal. Offering both couples counseling and individual counseling, Marriage Made Better™ combines research-backed relationship repair strategies with highly personalized counseling to address the unique challenges in your relationship. Thank you! You've taken a big step toward making your marriage more satisfying and fulfilling. Please check your email for a confirmation message and click the link to activate your subscription. Be sure to check your junk mail or spam folder if you don't receive a confirmation message. If you have any trouble, feel free to reach out to me at Carly@MarriageMadeBetter.com and I am happy to assist you. Your privacy is important to us. We will never share your email with any third party. You can unsubscribe at any time. You and your partner have probably already tried to work on your relationship without professional help and have most likely found that it's hard to change deeply entrenched or destructive patterns by yourself. Couples counseling provides you and your partner professional guidance and caring support as you experience a new way to address relationship issues while building a deeper emotional connection and understanding. Learn more. Perhaps you want to gain clarity about your relationship on your own. Maybe you don't feel ready yet or aren't sure how to share your true feelings with your partner. Perhaps your partner isn't willing to participate in couples counseling. Or maybe you need to work through a stressful circumstance you are going through that is negatively affecting your relationship. Individual counseling can help you understand yourself, gain clarity about your relationship, figure out how to handle complicated relationship issues and ultimately cultivate your own personal fulfillment and happiness. Learn more. In many cases, couples may argue about one topic without realizing the unspoken feelings, unmet needs and deeper desires that all too often remain buried in the subtext. The Marriage Made Better–Accelerator™ helps couples and individuals get a jumpstart on the therapeutic process that works to uncover these hidden meanings by assessing for these kinds of root issues in a comprehensive relationship assessment and analysis. The Accelerator can help you identify more quickly a road-map for repairing your relationship. Learn more. With enthusiasm, warmth, and a great sense of humor, Carly distills scientific findings into straightforward, practical suggestions as she guides couples and individuals through the process of developing stronger, more fulfilling relationships. Carly is a Licensed Marriage and Family Therapist, Adjunct Professor at Pepperdine University Graduate School of Education and Psychology, and founder of Marriage Made Better™ Relationship Counseling. Passionate about helping people have happy marriages, Carly has dedicated her career to studying relationships and helping people develop and maintain satisfying relationships as well as overcome considerable relationship obstacles. With enthusiasm, warmth, and a great sense of humor, Carly distills scientific findings into straightforward, practical suggestions as she guides couples and individuals through the process of developing stronger, more fulfilling relationships. Carly has extensive experience helping people heal from past traumatic relationship experiences. Often these traumatic experiences cause enduring emotional wounds that infiltrate subsequent relationships and cause dysfunctional patterns and significant barriers to experiencing loving connections with others. Through her work as a therapist at the non-profit domestic violence organization Laura’s House Counseling and Resource Center, Carly has helped countless former victims of domestic violence work through the painful and often frightening process of entering new relationships in which they take the risk to love and trust again. Seeing a need for intervention specifically aimed toward challenges in former victims' future relationships, Carly created and launched a group therapy program called ‘Dating After Abuse’ designed to help former victims not only heal and process past trauma, but also increase self-esteem and develop and practice the relationship skills that enable them to courageously and confidently move forward to enjoy healthy, happy romantic relationships free of violence. Carly is also a dynamic and engaging public speaker who has provided information and inspiration to a wide variety of audiences regarding the complex dynamics of romantic relationships. Approachable and refreshingly real, Carly brings concepts alive by sharing pertinent examples from both her clinical work as a therapist as well as her personal life. She has given multiple presentations on how to have satisfying relationships, how to identify and repair common dysfunctional patterns of communicating in relationships and how to effectively have difficult conversations and resolve conflict in healthy ways. She has also given presentations about how to build and maintain self-esteem and how self-esteem affects dating behavior in teens as well as adults. Carly has been a regularly invited presenter at Domestic Violence Advocate trainings, has been featured in an interview on Orange County radio station KNOC regarding the effects of domestic violence on teenagers and recorded a domestic violence public service announcement that aired on Los Angeles radio station KFWB News Talk 980. She has also been an invited guest lecturer in classes at University of Southern California Master of Social Work Program as well as University of California–Irvine Master of Science in Nursing Program regarding understanding and effectively treating victims of domestic violence. Click here to learn more about Carly's speaking and events. Carly is a Licensed Clinical Member of the California Association of Marriage and Family Therapists (CAMFT). Carly holds two masters’ degrees from Pepperdine University, MA in Psychology and MA in Clinical Psychology with an Emphasis in Marriage and Family Therapy and has a bachelor’s degree from University of Southern California. 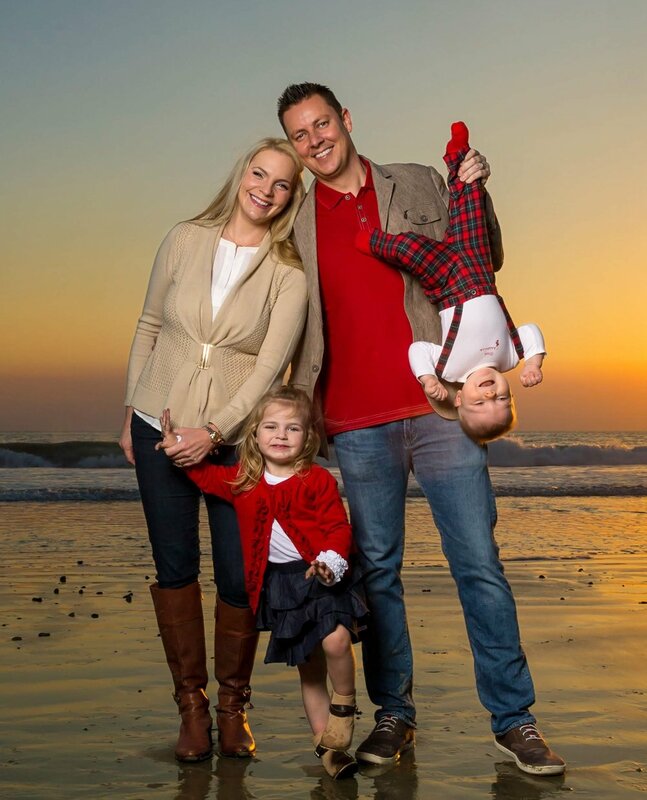 Carly and her husband Russ live in San Clemente, CA with their their two young kids, Beverly and Remington, and their little Yorkshire Terrier, Spencer. In her spare time, Carly enjoys pilates, musicals, reading, playing the piano, and enjoying good food with good company.